Monrovia Now: News and Comment about Monrovia, California: Opinion: Monrovia, Please Reopen the Gate to the Hillside Preserve! Opinion: Monrovia, Please Reopen the Gate to the Hillside Preserve! The public access gate off of Ridgeside Drive to Monrovia's Hillside Wilderness Preserve (map: http://goo.gl/PNzQYT ), which has been open most of this year, has now been locked tight, but is still officially open - Hikers can climb over the gate and bicyclists can lift their bikes over the gate or lay them down and shove them under the gate. "A few of the residents near Ridgeside voiced their concerns about seeing motor bikes in the Hillside. As you know unauthorized motor vehicles of any kind are not allowed and our Park Rangers patrol the Hillside twice a day, every day. The area is still open and accessible. Until the new gate can be installed, we wanted to give the area residents peace of mind that no unauthorized vehicles will be accessing the area. "As for the new gate," she added, "we want the location to be reviewed and approved by adjacent property owners. We hope to reach an agreement in the coming weeks and install the gate, shortly thereafter." "The thought was that pedal-power bikes can be lifted over the gate or slid under the gate; whereas someone may have more difficulty with a motorized bike. The future gate will have a separate pedestrian access, where if someone wanted to walk a bike through they could. Keeping out all unauthorized vehicles is a challenge and we are trying our best to find a balance between allowing approved access and restricting unapproved access." It seemed that if the city wanted to exclude motorized bikes, there should be a sign at the gate prohibiting them. 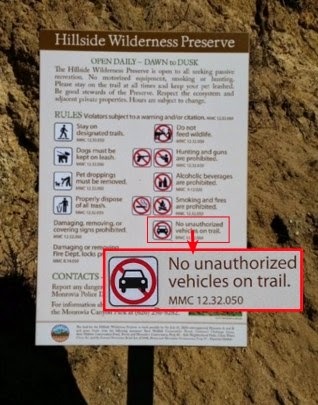 I looked and didn't see one, so I asked if it wouldn't be a good idea to just post a notice that motorized vehicles are not allowed. "Our hope would be that the signs are enough to eliminate any unlawful activity; however, that has not been the case. The attached picture shows a sign at Ridgeside where we have referenced no unauthorized vehicles, including the Municipal Code. I can see how additional clarification regarding motorized vehicles could be helpful. We will take time to review this a bit more." I have blown up the part of the picture that shows the prohibition against unauthorized vehicles. Yes, I completely agree that this sign could use additional clarification. I imagine one reason the sign hasn't eliminated unlawful activity is because it is unclear. I find it difficult to imagine why someone riding a little electric- or gas-assist bike would suppose this rule - illustrated by what is clearly an automobile - referred to him or her. I'm glad that, as Cherry says, this decision will be reviewed, because I think the gate should be reopened even while the city is planning a new gate. To lock a gate to an area the public should have easy access to because someone - who may have had no clue he or she was violating the law - rode a motor-assisted bicycle up the trail seems very unfair. I think that once the prohibition is clearly posted, then the solution should be to give warnings or tickets to those who violate the law, which should not be hard since, as she mentioned, the Park Rangers "patrol the Hillside twice a day, every day." To most people a locked gate means "keep out" or "closed," and that is the wrong message to send to people who are approaching an area that is in fact open, and which they are entitled to enter, and which they have been waiting something like 15 years for reasonable access to, and which they have been paying for through their taxes for year after year. I don't want to be overly critical because I know the city has made some effort to open this area, but I think closing this gate was the wrong move. Some history: Monrovians approved a bond measure something like 15 years ago to purchase this area as an open-to-the-public preserve, but both ends of this trail have been locked shut until January of this year, at which time a new gate was installed at the Ridgeside entrance and the old gate behind it was left open ( http://goo.gl/K5IGAk ). Then, recently, the new gate was removed but the old gate remained open enough so hikers and bicyclists, but not cars, could still walk or ride through ( http://goo.gl/zeccIn ). Now both ends of the trail are again locked shut. The gate at the other end of the trail, at the end of Cloverleaf Drive, has never been opened. So one person rides a motorbike up the trail and the immediate response is to remove a brand new gate? Great to see that the city has too much money that they can afford to do this. It's a dead end, you would think that if someone rode their motorcycle up the trail, that they could just stop him on his way out and write him up. Or maybe just install a bottom bar at the entrance, like they have at Canyon park. Grrr. How is the progress on opening up the Cloverleaf gate? Regarding Cloverleaf, I hope to have a small item up later today or maybe tomorrow.